If you're amazed by flying and airplanes, this is an essential experience! 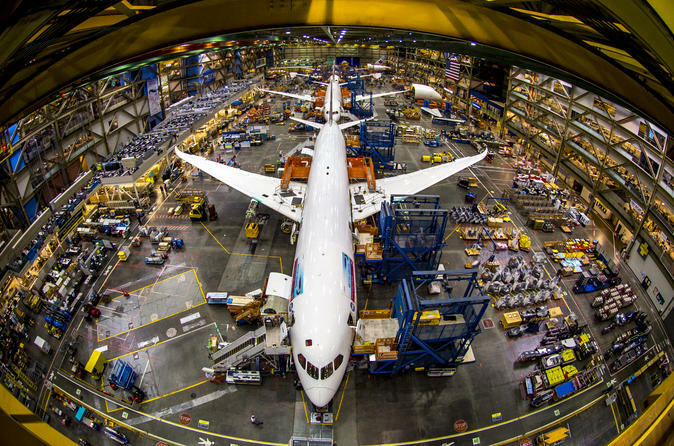 Tour the factory where they build and test the famous Boeing aircraft, the world's number one aerospace company. During this 4.5 hour small-group tour, you start off with a complimentary hotel pickup and depart for Mukilteo from downtown Seattle. Spend 1.5 hours inside the impressive Boeing factory on a tour that showcases the magnificent 747, 777, 787 aircraft used worldwide and the Dreamliner which is currently in production, all housed here in the world's largest building! Finish your day exploring the Future of Flight Aviation and Boeing gift shop before heading back to Seattle. Once you arrive at the Boeing factory, you will be escorted on an informative and fun 90-minute tour of the Boeing plant by Boeing representatives. You'll see where Boeing's 747, 777, and 787 Dreamliner aircraft are manufactured in the largest building in the world by volume. On the Boeing flight line, you will see airplanes in various stages of flight test and manufacture for airline customers around the world. Also visit the new Future of Flight interpretive center to experience the marvel of commercial jet aviation and production. Notice: If you have your own transportation, Future of Flight Aviation Center & Boeing Tour tickets may be purchased separately for $25.